Reviews » DVD Video Reviews » Bubble Guppies: Super Guppies! 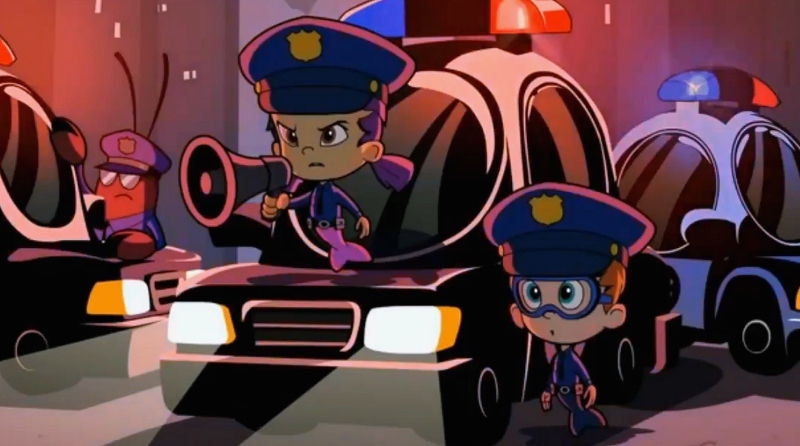 Johnny Belt and Robert Scull's Bubble Guppies (2011-2016) was an animated series aimed at pre-schoolers and kindergarteners. This colorful production featured half a dozen brightly haired mer-kids as they swam around and taught kids about everyday occurrences and subjects like new places, animals, and neighborhood jobs. The visual design fell somewhere between "Dreamworks" and your average Wii U game: characters were simple and kid-like, easily recognizable and, if your little one was/is a budding artist, pretty easy to draw. 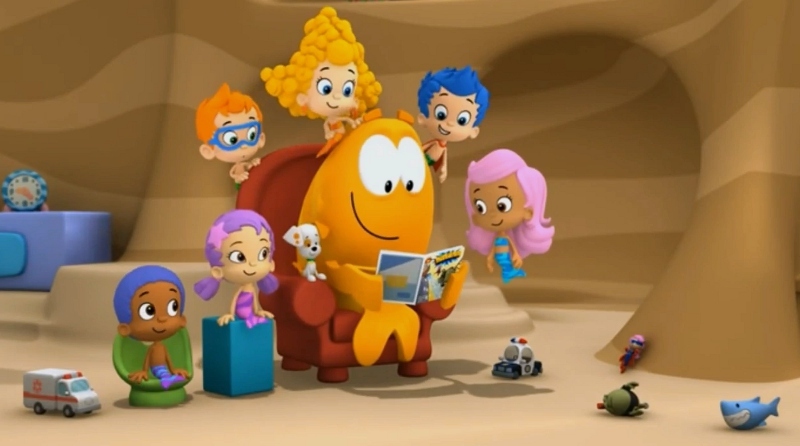 Bubble Guppies ran for four seasons and aired a final episode last October, only weeks before its non-renewal was announced. Unfortunately, Nick never fully committed to getting this show out on DVD; every six months or so (it's actually been a year since the last one), a few episodes were just plopped onto a single disc with a generic theme that maybe one or two episodes actually followed. While I understand that Bubble Guppies is hardly serialized, it would've been a lot easier to just stick with the more common "complete season" or even "volume" format, as piecemeal collections make it difficult to know what you don't have yet. Amazon has offered season collections via streaming for awhile now, so perhaps that's a better option. For now, it's business as usual: we get five more episodes ("Super Guppies", "X Marks the Spot", "Haunted House Party", "The Unidentified Flying Orchestra", and "Police Cop-etition", which originally aired between 2011 and 2015) on a single disc for around $10. Chances are, you've seen 'em already. If they're new to you or your kids, however, Super Guppies makes a decent enough rental. The show's familiar school-day formula still maintains a good blend of education and fun, with polished visuals and catchy pop songs that appeal to kids without completely irritating their parents. But the shortcomings of this disc (which include its lazy "random" format, as well as an uneven A/V presentation and lack of extras) make it one of the weaker collections of Bubble Guppies to date. If Nick treated some of their "younger" properties half as well as The Legend of Korra or Teenage Mutant Ninja Turtles, it'd be a minor miracle. Perhaps a complete series set is in the works? This is another mixed collection of episodes from a visual standpoint: the majority are presented in a (most likely) cropped 1.33:1 aspect ratio, while others look great in 1.78:1 anamorphic widescreen. I still can't believe that, in this day and age, any studio would resort to pan-and-scan, as all but the most stalwart grandparents have at least one high definition screen in their houses. Regardless, those 1.33:1 episodes are lacking in comparison with their overall softer appearance, occasional interlacing, and less vibrant colors. The widescreen episodes ("Super Guppies" and "The Unidentified Flying Orchestra") are impressive with smooth textures, a crisp appearance, and a much more robust palette. Here's hoping that future collections aren't this uneven, but I'm not holding my breath. Similarly, the audio varies as well: the 1.33:1 episodes are limited to Dolby Digital 2.0, while the widescreen ones are presented in 5.1 surround (both, for the most part, include at least one optional Spanish and/or French dub). This compromise is slightly more forgivable, since the spoken-word elements of this series are the most important thing and they don't seem any worse for wear. Dialogue is clean and crisp, although the poppy music cues occasionally sound a little flat in direct comparison. Channel separation is fine, despite that the surround effects are obviously missed on occasion. No optional subtitles are included, but each of these six episodes is Closed Captioned. As usual, the basic and colorful menu designs are attractive and easy to navigate. Only two episodes are presented with multiple chapter stops (guess which ones) and no layer change was detected during playback. Annoyingly, a static advertisement for other Bubble Guppies DVDs plays before the menu and forces viewers to bypass it manually. This one-disc release arrives in an eco-friendly keepcase with a not-so-eco-friendly matching slipcover and no inserts of any kind. Absolutely no Bonus Features are here either, which isn't all that surprising at this point. 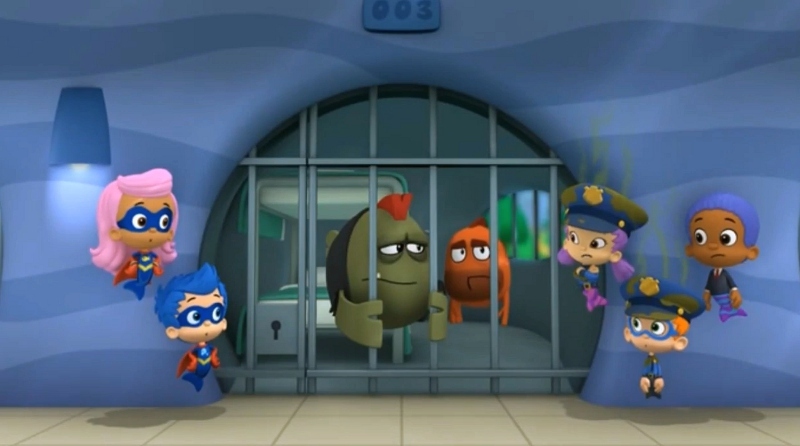 Bubble Guppies had a pretty good run during its five-year existence, as the show's colorful and kid-friendly formula made it one of the more tolerable and consistent shows for younger viewers. But Nick's lazy DVD release strategy didn't do it any favors: we've only gotten about half of the series' 80 episodes on disc thus far (possibly more), mostly via themed collections like this one or variety discs such as Springtime Adventures, and things haven't changed with Super Guppies. So unless a complete series collection is released in the near future, this (possibly final?) five-episode collection might be the last we'll get for awhile. Rent It, unless you've collected everything else thus far.